This is a normal Ethernet frame…do you see any field where we can specify to which VLAN our Ethernet frame belongs? Well there isn’t! So how does a switch know to what VLAN something belongs when it receives a frame? It has no clue so that’s why we need another protocol to help us. As you can see we have computers on both sides and they are in different VLANs, by using trunks we can make sure all VLAN traffic can be sent between the switches. Because our regular Ethernet frames don’t have anything to show to which VLAN they belong we will need another protocol. 802.1Q: This is the most common trunking protocol. It’s a standard and supported by many vendors. ISL: This is the Cisco trunking protocol. Not all switches support it. Here’s an example of an 802.1Q Ethernet frame. As you can see it’s the same as a normal Ethernet frame but we have added a tag in the middle (that’s the blue field). In our tag you will find a “VLAN identifier” which is the VLAN to which this Ethernet frame belongs. This is how switches know to which VLAN our traffic belongs. There’s also a field called “Priority” which is how we can give a different priority to the different types of traffic. This is useful when you have one VLAN for voice over IP traffic and another VLAN for data traffic, you probably want to give the VoIP traffic priority or your call quality might suffer. I hope this has been helpful to understand 802.1Q. If you want to know how to configure trunks…take a look at this tutorial that I wrote earlier. 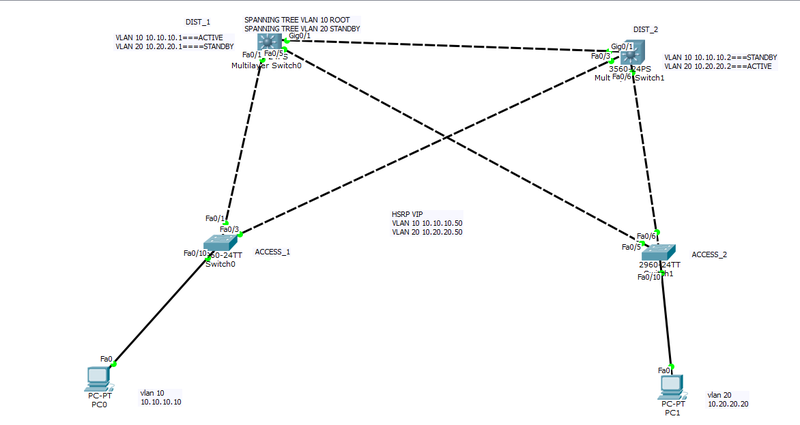 It explains how to configure trunks on Cisco Catalyst switches. Thank you very much for your reply. It really helped. Here is the topology that you described. We assume that no additional SVIs or routed ports are configured on either switch. EXCELLENT. This has been really helpful and thank you so much for your time. I am sorry for asking you so many questions. One more question. When I am doing a traceroute from 10.10.10.10 to 10.20.20.20. I am getting the below result. Got it. Great and accurate explanation once again. Thank you so much.